Roulette is not a game for which you can develop certain skills. The outcome of the spin of the wheel is pure chance. Nevertheless, there are several roulette strategies and systems that have been developed to help you bend the odds to your advantage. Use these strategies to increase your chances of winning. Fibonacci sequence Your bet is the sum of the previous two bets. Labouchere Out of a random sequence of numbers, the bet is always the sum of the outermost numbers. Martingale system When you lose you double your bet. When you win you start over again. Red Bet You keep doubling your bet on red whilst keeping a constant bet on black. D’Alembert system You bet only on even chances. When you lose, you raise your bet by one, and when you win you decrease your bet by one. Columns strategy You put one credit on the first column, double this on the second column, and quadruple it on the third column. The ‘one hit’ miracle You keep betting on a single number. The memory game You bet on all numbers on the table except for the last three numbers that won. Pivot You bet on the first double number and keep your bet constant for 36 rounds. Would you like to apply one of these strategies in the game? Play free roulette or play roulette for real money now. Make sure you carefully read the rules of the game first. The Fibonacci sequence, the sequence of numbers in which each number is the sum of the previous two numbers, is a system that can be applied to roulette. When using this system, you first bet on an even chance. When you lose, count up the two previous bets and make this your new bet. This way, every time you lose you take one step further in the series. When you win a round, you take two steps back in the series. Imagine you win in the fourth round, you will then only bet one credit in the next round. So, when you lose you should take a step up in the sequence, but when you win you can take two steps back. You write down a random sequence of numbers before you begin, for example 2, 4, 6, 2, 4. Your bet is then the sum of the two outermost numbers of the sequence (2 + 4 = 6). When you lose, you write down the amount you lost at the end of the series. The sequence of numbers now becomes 2, 4, 6, 2, 4, 6. Then you bet the sum of the two outermost numbers again. When you win, the outer two numbers are crossed out. With an almost 50% chance of success, the chances of winning are big. This roulette strategy is much-loved by many players. 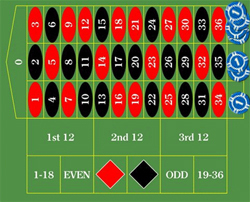 Out of the various different systems used for playing roulette, the Martingale system is perhaps the most popular. What it boils down to is that you double your lost bet when you lose. When you win, you start over. This roulette system has definitely proved itself. In theory, it is practically impossible to lose with this system. However, it is important to stay disciplined when placing bets; don’t take any unnecessary risks. When playing roulette, you also have the option to bet on a color. This strategy is called the Red Bet because, statistically speaking, most players bet on red. 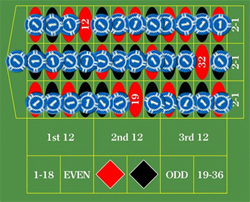 The idea is to keep doubling the Red bet whilst keeping the bet on the black fields constant. You will start with a bet on red. For the next spin of the wheel, you double your bet on red and place your original bet on black. The same thing happens in the next round, etc. The advantage of this strategy is that you keep your chances constant whilst spreading your bets. In the D’Alembert system, bets are only placed on even chances. When you lose, you add one credit to your bet. When you win, you take one credit off your bet. This will always balance you out at 0 when you make a profit. A simple but effective roulette system. When using this strategy, you only bet on columns. You bet a small amount on the first column, double this amount on the second column, and quadruple this amount on the third. The bet is doubled with every spin, and the other bets increase at the same rate. The one hit miracle is based on the idea that the ball will eventually have to land on a certain number. It is reasoned that the longer a ball has not landed on a particular number, the greater the chance that the number will come up soon. When using this strategy, you constantly bet on the same number. With the memory game, you bet on all numbers on the table, except for those that won the last three spins. 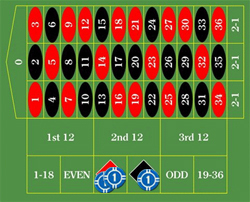 This roulette strategy is based on the unscientific idea that numbers are not immediately repeated in roulette. When using this strategy, you must first keep track of the numbers that have won on the table. When a number wins twice, it becomes your ‘pivot’ number. You will now bet on this number for the next 36 spins. This system is based on the ‘law of the third’. According to this law of nature, only 24 different numbers will appear in a series of 36. This means that several numbers will have to appear more than once.